I've mentioned before that I am very fond of Holly Thompson's work - her novel Ash is my favourite title set in Japan and among my favourite books, period. When I saw that she had written another book, I picked it up with hardly a glance at the summary or even the reviews on Amazon. I was surprised, when I finally held it in my hands, to discover that Orchards is written entirely in free verse. I'll admit that poetry isn't usually a lure for me. I was a little dismayed, especially since the synopsis given was very interesting - but after opening the cover, I never looked back. Orchards' style is entrancing and lyrical - when I realized it was poetry, I had briefly envisioned a novel in the style of Basho. Fortunately, I found this to be much lighter reading, in style if not subject matter. Orchards is certainly aimed at a younger reading audience than Ash was, though I still felt it was mature enough to be appreciated by adults. The length is quite short in comparison to the book's thick appearance, however, as the poems are laid out stylistically. You can expect to finish this quickly, so the reader who prefers a longer story, or is leery of a teenage protagonist, should beware. The main character is Kanako Goldberg, a half-American, half-Japanese girl born and raised in New York. After the suicide death of one of her classmates, Ruth, due to bullying, Kana is sent to Japan for the summer to live with her grandmother and work on the family's mikan farm. While she speaks Japanese fluently, she struggles with fitting in, missing her parents and sister, and living under the rule of her strict and traditional grandmother, who only recently has accepted the American branch of her family. Kana is very thoroughly American, despite her heritage, and feels their differences at every turn. Her biggest hurdle is working through the death of her classmate. While she was not directly responsible for Ruth's death, she feels immense guilt and a definite sense that Ruth was not so different from her and her friends. The book reads like a letter to Ruth as Kana tries to come to terms with the loss - and ultimately, prepare herself for what might come next. The pace and voice of Orchards are both fantastic, but the imagery is bar-none. The author did an immense amount of research into mikan farming and was able to paint a very realistic scene of Kana's life on the farm, in the backwoods of Shizuoka prefecture. I could almost smell the mikan as I read! Like in Ash, the setting is the strongest feature, though the plot and characters are hardly lacking. Kana is perfectly developed, and the supporting cast receives just enough care as to make them realistic. It is Kana that the reader comes to feel for - and while her issues may not be close to the reader's heart at the beginning, by the end, she becomes very real indeed. 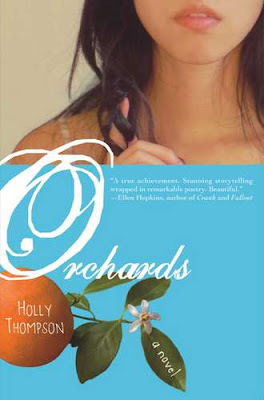 Check out Holly Thompson's Orchards on Amazon or Amazon Canada!